India has known about cannabis from the very dawn of the civilizations at the Indus Valley and has since used the plant for important life saving applications such as medicine, food, and even shelter. Inked in the ancient Vedas by the Indian scholars are some of the earliest documented accounts of cannabis used as a medicine that goes back to 2000 BCE, and even the people who invaded India couldn’t stay too far from this plant,e.g. the Portuguese who captured Goa in 1510, quickly learned how cannabis played an important role in Indian culture, day to day applications and especially about the narcotic effects of the plant. A glimpse of which can be found in the Notes by Garcia de Orta A botanist who wrote about foreign cannabis colonies of Portugal in 1534 in his work:"Glossário Luso-Asiatico". Even during the British colonial rule in India which lasted over 200 years, in 1894 an extensive study was conducted and a report was published by an Indo-British team known as Indian hemp drugs commission, which pinned down the Physical, psychological and socio-cultural effects of cannabis in India. The plant itself is virtually found in every direction you go to in India However North India is widely cited as the biggest charas producing region,featuring the notorious and the elusive highland Himalayan villages, spreading all the way from Kashmir to Himachal and down to the China border in Uttarakhand. Any kind of enquiry concerning cannabis in India is incomplete without understanding the role of north Indian cannabis regions, such as - Jammu and Kashmir, Himachal Pradesh, Haryana, Punjab, Utter Pradesh, Uttrakhand and Rajasthan. Although it is to be noted that Punjab and Haryana being flat lands among the listed states doesn't have any rigorous cultivation or large feral fields of cannabis anymore just like the capital state New Delhi where an exponentially rising population has already taken a severe toll on the nature and some of the regional cultivars from these areas have either vanished or are on the verge of being lost forever. GEOGRAPHY : Northern India is guarded by the great Himalayas on the north through Indian states - Jammu & Kashmir, Uttrakhand and Himachal Pradesh, Thar desert (Rajasthan) in the west and Gangatic plains towards south, from where begins the flat lands of Utter Pradesh, Punjab and Haryana. The tropic of cancer slices the county in exact half and divides it between temperate climate for northern India and tropical for southern India. Northern India also features alpine and tundra climate as we move up north towards Jammu and Kashmir. The Himalayas in northern India not only acts as an effective barrier against the extreme temperature but also facilitates the monsoon season which plays a pivotal role in the october harvest of rice. The Gangatic plains make up for the most densely populated areas of India for being relatively easier landscapes to urbanize than Himalayan mountain or the desert in the west. Thar Desert in the northwest india lies majorly in India (85% approx.) and a small portion in pakistan that borders with the Indian state rajasthan. On the north-east of the desert, Arravali ranges runs through rajasthan towards Gujrat which features mostly an arid and dry climate, with very little yearly rain. All these geographical factors account for the flora and fauna found in northern India and especially for the cannabis landraces found in these parts of India. Although most of the north India primarily features short flowering/highland sativas there are some pure Indica landraces to be found up north in jammu and kashmir. To further understand these regions and the respective cultivars, we need to take a somewhat detailed look at all the regions individually. JAMMU: If we start literally from the top of the India, well known as the crown of India - Jammu & Kashmir is the first state that we can zoom into for the information on a few different sativa cultivars and an elusive Indica cultivar. Jammu & Kashmir has a few extremely varied climate zones due to the complex geography and In order to simplify the jammu and Kashmir you can dissect it into two parts a large semi-mountain and mostly urbanized region of Jammu and a huge valley surrounded by Karakoram and Pir Panjal range, called Kashmir valley. Jammu, which shares borders with two north Indian states (Punjab and Himachal Pradesh) and being intensely populated for the most part, doesn’t have dedicated hash/Ganja regions within the Jammu region. Charas can be easily procured almost anywhere though, as a high volume of good quality product regularly gets smuggled into the state from the notorious charas producing neighbor, Himachal Pradesh. 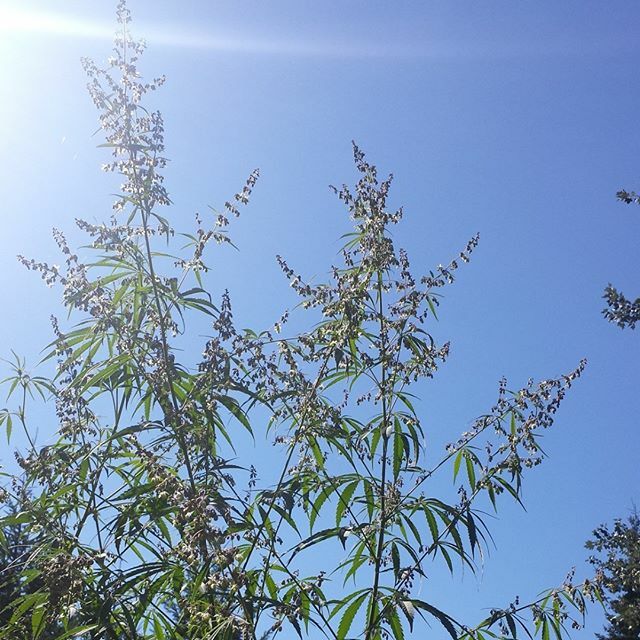 The Landrace cultivar found in Jammu gives out a consistent, thin leaved sativa phenotype, which has a unique blend of flavors from spices to mint/eucalyptus. As mentioned above, there is no systematic cultivation of cannabis in Jammu region, so these plants come up almost everywhere, from road sides to semi-forest type areas. Most of the plants struggle to reach full maturity due to human involvement, and the ones that do get any considerable flower production are hand rubbed to produce a lower quality hashish in very small quantities by local-smokers. KASHMIR : Kashmir Valley is perhaps the most interesting cannabis region due to many reasons, ranging from socio-political to geographic and everything in between. A constant war-zone like ambiance in the valley discourages enthusiasts to scout many a great hot-spots for naturally growing cannabis, like the far out valleys towards the Pir-Panjal ranges, Jhelum river basin and P.O.K (Pakistani occupied Kashmir) from where the Indica specimen originates. This particular Indica cultivar, is a stout and short plant, which stays around 6 feet maximum with closely held internodes and an over all bushy true indica structure. Most reported phenotypes from this region sport floral or fruit based terpenes with the exception of some phenotypes having skunky/fruit-like terpenes. Its currently quite difficult to get a detailed study on this cultivar because of the controversial relationships between India and Pakistan in respect to Kashmir valley. Unlike the Indica counterparts, sativas are found fairly easily growing at non populated areas in Pulwama District, which is a balanced mix of forests, countryside and urbanized localities. One can Take a bus from the capital, Srinagar, and through National Highway#1 can reach there easily. Pulwama is also famous for basmati rice and some of the best quality saffron which is systematically cultivated by the local farmers, however cannabis not being a viable cash crop option for farmers is still cultivated in guerrilla style by countryside farmers for mostly a special kind of charas known as "challi or Garda", which is produced by separating trichomes from the dry buds with the help of screens and then pressed into fingers or bars. As far as the flavors are concerned, the sativa produces a consistent spicy/fruity base found in typical highland plants and a strong hashy undertone. yet another phenotype has been reported from a different district of Jammu & Kashmir named Barramulla. Its surrounded by Kupwara, Poonch, Badgam and Ganderbal district which extends upto the line of control between India and Pakistan. Baramulla has a quite healthy economy through the means of national/international tourism and apple production and doesn’t have any planned cannabis cultivation at all, although a sativa variety can be seen growing wild in small numbers. The reported cultivar has a very primordial open sativa structure and grows very tall. This old world sativa from Baramulla has a basic hashy flavour with very light notes of mint/basil and an essential oil like flavour can be tasted on the exhales, which is essentially like mixed extracts of herb/flowers. Himachal Pradesh is an Indian state entirely perched in the laps of Himalayas is the undisputed champion of charas production. Himachal almost entirely has an alpine/highland climate as far as the cannabis growing regions are concerned, with a lot of speculations of an elusive indica strain, so far only narcotic highland sativas have been reported and collected. There are three main regions in Himachal Pradesh which cultivate and produce high quality landrace and heirloom cannabis - Chamba District (situated between Dhauladhaar and Peer Panjal ranges), Kullu Valley (its tucked away villages in the serene himalayan wilderness) and the notorious Parvati Valley, which is also situated in Kullu district, but has a mark of its own when it comes to resin production. Chamba District lies in the northwest territory of Himachal Pradesh, and borders with Jammu and Kashmir to the north west and west with Laddakh area the district is home to some great flora and fauna including one of the zestiest and citrusy hashplants which is farmed in small patches by native Himalayans. These remote villages are far from the echoes of the capital town chamba which has become a tourist hotspots as tourists from all over the india find urban facilities here and then skew off to feral trails in the lush valleys. 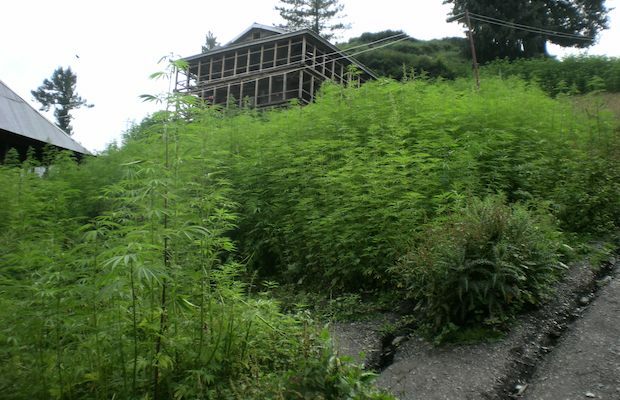 Almost every cannabis village in the district is far above from the paved-modern roads and trekking routes upto 25 kms are usual to reach them. Even though chamba is not documented very well in terms of cannabis farming like some of the other siblings but here's some insight into the variety found in chamba from a subjective accounts of an undisclosed hiker : " The plants weren't as tall as you'd see in parvati valley and a deep lemony stench mixed with signature landrace hashy taste was all I could smell. some of the plants had broad fingers like indica but internodal spacing was much like a classical sativa." Kullu : The backbone of the charas-ridden underbelly of kullu district rests upon these lesser known Himalayan villages - Biasar, Hallan, Aani, Bhalyani, Lag valley, Bhutti and many many more. Every small village plays their role in towering the stacks of charas which then goes to every part of the country and sometimes outside as well. Its difficult to pin down a specific poster boy pheno for kullu valley but to put it in simple words, It works like a pyramid where the base is Pine and then more subtle floral and fruity flavours build upon it to create an unmistakably exotic experience for the consumer. As far as the genetics are concerned, all these villages are within the alpine/highland climate zone and can be classified into highland sativa category with a short flowering cycle, which is harvested within october before the snow sets in from mid-november. 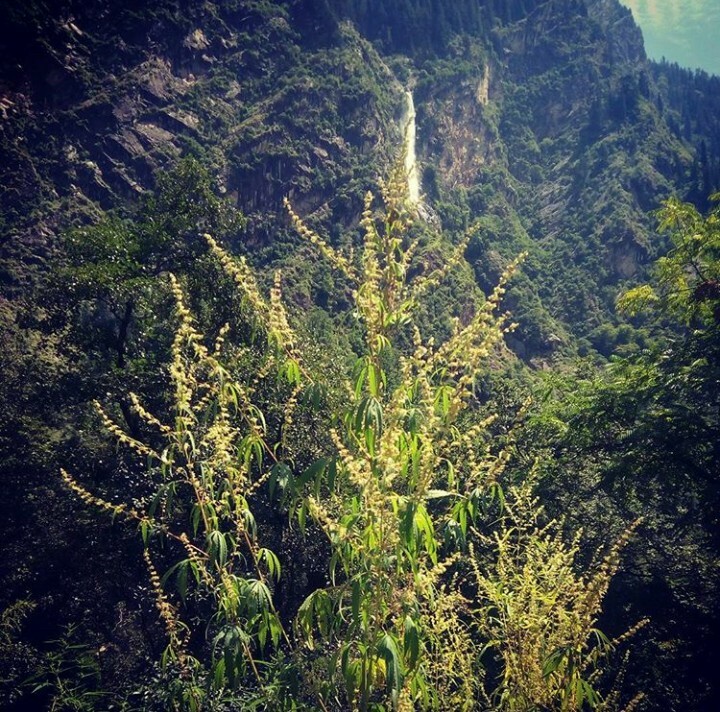 Parvati Valley : If there is a cannabis haven on the earth it's probably here at Parvati valley, some of the uber notorious sub-valleys and villages like Tosh, Malana, Grahan, Kalga-Pulga, Rashol, Chalal, Kheerganag lies within it. Parvati sees a heavy influx of foreign cannabis related tourism which has been on a rising trend ever since media takes on this region surfaced on internet- like strain hunters documentary by a dutch seed co. and some more. To completely understand the region, one has to come down here and grip the raw nature under the wake of awe-inspiring Himalayan ranges, but in words - parvati valley is abode to the endless farmed cannabis, as if you suddenly step into a different country where cannabis is free. Farmers are wiser and understand the craft of cannabis growing a bit more than other areas. Some farmers even select specific phenotypes and try to achieve consistency in their fields which ultimately converts into a consistent tasting finished product (charas). An array of flavours including - holy basil, mint, mango, berries, cherries, tangy, rotten fruit, sandalwood, pepper and more are commonly found in the plants growing here, the plants are very stalky ( long hemp like stalks) with huge fan leaves and can easily grow as tall as 14-16 ft. flowering generally starts around the first to second week of august and finishes mostly within the month of october with quite a few selected farmers taking it down to the wire till the valley freezes over. This highland sativa variety makes for an extremely heady stash, a pure sativa high, as uplifting as psychedelic in nature, giving a new meaning to cerebral high. In last decade or so Parvati valley has gone overboard with tourism and a lot of tourists from Europe and Americas have made attempts to cross pollinate this landrace to dutch varieties, however in a bad way because most of the people instead of taking seeds into their stable and breeding it behind the doors have thrown hybridized varieties in the wild in hopes of seeing some wonderful experiments unfold out in the wilderness. Lastly When it comes to Himachal Pradesh There are some underdogs in the game as well, like Chauhaar valley and Barot valley which are situated in the mandi district and aren't well known for charas production, but in terms of genetics these 2 valleys are responsible for the most floral varieties of cannabis to be found in all of India. Some of the plants smell so unbelievably flowery that you can smell clear and pronounced wild flower terpenes without otherwise overwhelming hashy baseline. Utter Pradesh is a state with over 200 Million inhabitants, who live throughout these gangatic plains. Ganga (ganges) and Yamuna are the two major rivers which flows through Utterpradesh and meet at Allahbad from where it continues its eastward journey to ultimately meet its fate at Bay of Bengal after creating one of the most fertile regions in the world at green delta with Brahmaputra river. Apart from the green delta ganga and yamuna rivers also fertilize the entire backbone of the Indian agriculture including some undocumented crops such as Ganja. Not a great deal is known about the landrace strain which grows throughout the entire state, however the state does produce tons of ganja every year to satisfy the chronic need of an entire state which is the epicentre of Hinduism and sees a lot of leniency in terms of smoking ganja, compared to other places in India. Places like varanasi (Benaras) where the Famous "kumbh" festival is celebrated are almost impervious from getting caught with cannabis as the religious intimacy of cannabis plant in hinduism plays a vital role in normalization of cannabis use openly. Although, majority of the charas consumed here is imported from the Himalayan state Uttrakhand, where cannabis farming has been an age long ritual and urban high class consumers haven't found their way into the villages yet. Utter Pradesh has a consistent climate throughout the state with negligible difference in humidity and temperatures from one region to another and the reported landrace from this state shows a very consistent phenotypic expression throughout. The sativa landrace that grows out here, doesn't produce much resin as compared to the highland verities in India and terpenes are very similar to central Indian strains such as the famous Mysoore Mango, Raw mango flavour stands out as a common marker for this landrace with the landrace hashis taste. It's difficult to do a detailed study on this landrace strain as most of the crops are grown and owned by mafia/cartel style gangs, who control the supply of crops and finished product within the state. The cannabis enthusiasts and experts alike would tell you how places like Parvati valley or Kashmir grows some of the best cannabis in India, but buried under the lush green cover of pine and deodar is a secluded state which barely ever surfaces as a cannabis hotspot and would make you think otherwise, should you be game to reach the himalayan villages of uttrakhand which could ask for a climb upto 12-13,000 feet. There are many a great cannabis regions within this state and different altitude and environmental conditions have shaped those plants into different heirloom varieties. 3 Main growing regions in Uttrakhand would be - Nanda Devi, Utter-kashi, Kumaoun district. Kumaon district - Kumaon district borders with Tibet and Nepal and is home to The rivers like Gori, Dhauli, and Kali Ganga, which flows through the southern slope of the Tibetan watershed. Kali Ganga and the Pindari rivers whose water join the Alaknanda and form the international boundary between India and Nepal. The pilgrim route currently used to visit Kailash-Mansarovar goes along this river and crosses into Tibet at Lipu Lekh pass. The Kumaouni heirloom is a sativa cultivar, which can be found growing in big and small farmed patches by the villagers in an effort to strengthen their economic situation and to nourish themselves with traditional cannabis related food. A variety of cannabis related delicacies can be easily seen in everyday use at a common household, like chutney, full plant juice, masala vegetables and even the oil extracted from seeds is used for a variety of uses ranging from medicinal to edible. The reported phenotype from kumaon region features a very deep and rich flavour which ranges from fruits to citrusy/tangie, suitable for making extracts. The plant grows in difficult terrains although the fertile Himalayan soil helps but frequent rain and cold weather can be handful for any plant which cannot withstand adverse climate conditions. These plants vegetate fast and flower even faster as they finish inside 10 weeks, which is quite fancy for an heirloom sativa. This plant induces a very heady high also energetic in nature with almost non-existent body effects. Utterkashi - Utterkashi is one of the districts of Utterakhand and is bounded by Himachal Pradesh and Tibet from north and north east respectively, both great rivers of India Ganga and Yamuna originates from the glaciers present in this very district. Gangotri national park is one of the most beautiful places to visit here, while a lot of rare species of flora and fauna can be seen here thriving naturally and cannabis is not an exception. The plant can be found growing naturally and also in farmed patches by Himalayan farmers at ease, the highland variety found here is similar to the Kumouni in a lot of aspects and shows little difference in physical structure as well. However an elusive Indica variety of cannabis is found in a nearby area, Jaal ganga valley at the border of India and China, it was one of the main routes of trades between India and Tibet until 1962, and was founded by Pathans of Peshawar -Pakistan in 17th century. A few kilometers ahead lies the Nelong Valley where the said indica phenotype is actually found however this valley has been closed to tourists since the ino-china war has now been opened to venture (since 2015). Nanda Devi : Nanda devi is easily one of the highest places cannabis is found at, which ranges upto 4000 mtrs. or approx. 13,000 FT. Nanda Devi's highland sativa is one of the more interesting plant as it seems to express a mixture of both sativa and Indica traits through its physical structure and psychological effects which it induces upon its users. Nanda Devi is the name of the goddess who is worshipped in the entire district of Chamoli as the gaurdian angel of the valley and the highest mountain to be completely inside India was named after it as well which peaks at 7,800 meters or 25,000+ ft. which also lies in the same district (Chamoli). In order to find cannabis one has to go deep inside the feral-untouched valleys, blazing-trails to catch a glimpse of this unique cultivar. However there are a couple of villages who do farm cannabis to earn their bread, Malari andTtapovan are two of the famous villages where farmed fields of cannabis can be found. Interaction with these farmers is not easy as they aren't used to welcoming tourists like Himachal Pradesh and a local guide is advised if one plans to approach the bhang farmers. Now, to talk about the plant itself, Its a short flowering highland sativa with some unmistakable traits of indica, like Broad fingers in some odd phenotypes or close internodes which at time gives it that bushy look. Nanda devi is probably the only landrace found in India wherein the terpene profile is not complex at all, It features a straight up soaring mango flavour, which is a very ripe mango candy like flavour, and makes you want to bite down on the bud itself, also ripe cherries flavour can be smelled on top of mango in a lot of plants, with some odd plants having more of a cherry smell and side notes of mango. Rajasthan : Rajasthan is a desert state in north India that spreads out to east and borders with Gujrat, the great thar desert covers a great area of this state which then extends into Sindh and Pakistan. Rajasthan has had a rich cultural history and many a great rulers ruled it before democracy, the ancient remains of their reign are still intact for the viewing pleasure of public. even though Rajasthan is a dry, arid, desert terrain, cannabis plants have found a home in these conditions by adapting to the environmental challanges and are thriving for thousands of years. The Rajasthani heirloom is basically the punjab hashplant, which has adapted to the hot and unforgiving conditions here, The leaves are very small and often grow in bunches together which creates a unique physical characteristic and serves as a genetic marker. These plants can go without water for very long durations without wilting and show incredible hardiness in the face of scorching temperatures which can range from 120-145 F in summers. The rajasthani heirloom flowers fast and finishes in 10 weeks, with very airy buds and no tangible bud structure at all, at times plants takes on forms which barely looks like cannabis. Terpenes on this plant doesn't vary alot and from vapour rub like aromas to eucalyptus, mint and raw mango can be easily found in combinations and in isolation. The recent economic-development and infrastructure has affected these ancient varieties in many ways and much of the plants are receding back to wilderness as the urban landscapes are finding their way into the natural habitat of this glorious plant. There are many breeders and preservationists who are putting together resources to collect all these varieties and preserve them for our future. As of today the NDPS act against narcotics include cannabis as an illegal plant with only its seeds and leaves being allowed to be used for edible and cultural purposes, however a bill to legalize cannabis has been submitted by the in-effect government into the parliament , and is yet to be discussed. In order to preserve these landraces in India it’s imperative to have a legal programme around cannabis so that instead of misinformation and taboos, we can spread the correct scientifically evaluated facts about the plant and how it can heal countless disorders without having to worry about overdosing like opiates and other classes of drugs. The uses of this plant range from textile to automotive and virtually can sustain our entire being, but until this precious plant is in the prison cell of our ridiculous laws, opportunities will remain limited and distant.